Roller shades have come a long way, and there's no limit to the looks you can achieve with the products available today. The Roller Shades by Levolor are a great alternative to custom-made window treatments, and can also make for a fun DIY project. Functional and durable, these shades are available in a wide variety of colours, materials and styles to suit any taste, They can be purchased and cut-to-size at Home Depot, and easy-install brackets make this product a breeze to secure to your wall or window frame. If roller shades don't quite fit the bill, then consider the use of cellular shades. These window treatments offer light-filtering and room-darkening qualities, along with energy-saving insulating properties to help keep your home cooler in the summer and warmer in the winter. Try the Cellular Shades by designview. 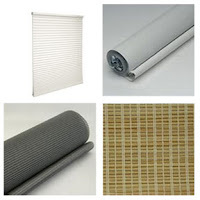 Similar to roller shades, these shades can be cut to size and mounted with easy-install brackets. Both roller and cellular shades come in a variety of materials to provide varying amounts of light-filtering, and a wide assortment of colours and styles to match any décor. For a sleek, modern look, our favourite is the Decorative Solar Shade from Levolor. At Home Depot, Roller Shades by Levelor range in price from about $24 (46.25" x 78") to just under $70 (55.25" x 72"), while Cellular Shades by designview are available from $39 (23" x 48") to $86 (60" x 72"). Brackets are approximately $2 for a pair. You can opt to make installation a DIY project using easy-install brackets, or Home Depot can provide installation at fee of about $225 for a maximum of 5 windows. This service does not include in-home measurement. Prior to visiting the store, measure your window(s) for width and length, paying attention to the entire area that should be covered by the shades, which can either be installed above a window or within a window frame. Here are some tips from Levelor to ensure proper measurements. If both in-home measurement and installation are required, Home Depot will refer you to an authorized service provider to handle your needs.